Jr. Jocelyn Sweeney was driving to school on a snowy January morning. Turning onto Butternut, she knew the roads were icy, and it made her nervous seeing all of the surrounding traffic. Seconds before she passed the Mobile gas station, the three cars in front of her collided. Unable to gain traction with her all season tires, Sweeney spun clockwise and an oncoming van hit her. Her dad was upset, but understanding because he planned on getting her snow tires, but hadn’t gotten around to it yet. For experiencing such bad driving conditions, all Michiganders should use winter tires, but they don’t. Maybe they don’t understand the difference, or maybe they don’t want two sets of tires. There are huge differences between winter and all season tires. 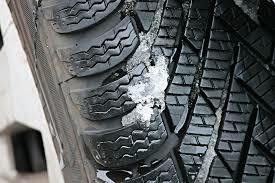 In cold temperatures, the tread rubber of all season tires stiffens causing poor traction. The tread rubber compounds in winter tires remain flexible in cold temperatures, allowing the tire to grip the road. Another reason winter tires improve performance is deeper tread depths and distinctive tread patterns. Deeper tread depths reduce snow buildup and provide better traction. Various tread patterns channel snow and expel water. An increased number of biting edges, tiny slits, provide traction on ice. All season tires can’t match the benefits of having winter tires because they are a compromise between winter and summer tires: they don’t have the grip of a summer tire or the design of a winter tire. All season tires cost between $60 to $120 each. Winter tires with the cost of all season tires combined will cost more than just all season tires in the first year, but over two years, they will cost the same. A pair of regular tires last about three years on average, depending on driving habits. But, using winter tires for half the year means the all season tires aren’t being worn out, so they’ll last twice as long. To save money, use a cheaper tire during warmer months because most people don’t need an expensive, high performance tires for driving to and from the beach. To cut down the cost more, some people purchase an extra set of cheap rims for their winter tires. Doing so reduces labor costs because changing out the rims is a hassle. Some tire shops might even offer free services with the purchase of winter tires. Anyone who has used winter tires knows the difference they make. Don’t be like Sweeney. Buy yourself some winter tires: you may end up saving money by avoiding a costly accident.